Nuclear Magnetic Resonance (NMR) spectroscopy is a very powerful non-invasive technique that provides detailed structural information in various molecular systems. 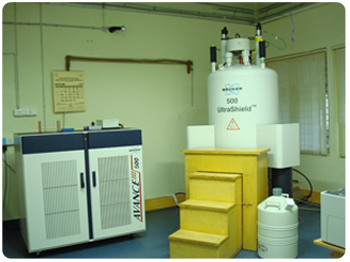 The AVANCE III 500 NMR spectrometer is dedicated for multi nuclei, Solution State NMR experiments. 11.7 Tesla, actively shielded, standard bore (5.4 cm) long hold, super-conducting magnet with built in cryo-shims & 34 channel room temperature shims. Stable lock compatible with pulsed field gradients, gradient shimming with low heat dissipation. Automatic gradient shimming, Deuterium lock. The basic unit has four RF channels to carry out triple resonance experiments, phase resolution > 0.1 deg, frequency resolution > 0.1 Hz, Provisions for observing all nuclei including 19F� amplifier power: 300 W (LF) & 100 W (HF)� high band and broad band pre-amplifier, shaped pulses generations in all RF channels, dual 21-bit ADC.